For enquiries on event details, arrangements & etc. Saturday 30th December 2017 or upon reaching the maximum of 2,000 participants. Category A – D (10KM) are open to participants who are aged 16 years and above. Category E (5km Fun Run) is open to participants who are aged 7 and above. Parents are allowed to bring along their children below the age of 7 within the 5km Fun Run at their own risk. Parents must take full responsibility of their children’s wellbeing pre, during and after MMA-Schomos Charity Health Run 2018. NO registration is required for children aged below 7 years and therefore they will not be entitled for t-shirt, finisher medal, certificate and etc. Organizer cannot be held responsible for the safety and wellbeing of any child below the age of 7 years. 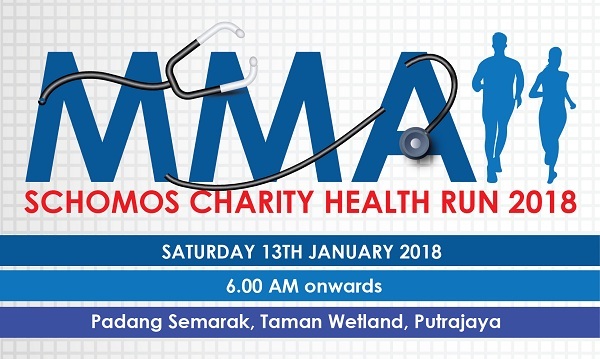 MMA-Schomos Charity Health Run 2018 shall be conducted under a set of competition rules. Age qualification will be taken as of 31st December 2018. The results of the individual categories (A – D) will be verified by the organizing committee and their decision is final. Winners must ensure to collect their prizes after the race and upon announcement of results. All uncollected prizes will be forfeited. Therefore, please ensure to pay online when you register online. Race pack consists of Dry Fit Running Tee, a number bib, safety pins and race guide (if any). Please be advised that the quantity of the Running Tees’ ordered according to sizes are limited, therefore the distribution shall be carried out on first-come, first-served basis. Venue : Level G (near AEON Big Entrance), Alamanda Shopping Centre, Jalan Alamanda, Presint 1, 62000 Putrajaya. All the race packs without any special arrangement with the organizer and not collected during the stipulated collection date, will be deemed as unwanted and the Organizers shall be at liberty to dispose or re-distribute them accordingly. Any late collection of race pack(s) without prior agreement/arrangement with the organizer will be charged RM 10.00 per race packas the late collection fee. So, please ensure to collect the race pack on the stipulated collection days. For collection of 10 race pack and above, please email your bulk collection name list (full name and IC number of each participant) to customerservice@msports.com.my latest by Saturday 30th December 2017. Please ensure to submit the authorization letter for each participant listed in the bulk collection name list at the bulk collection counter on the race pack collection day. Foreigners and outstation runners whom resides outside Klang Valley (Kuala Lumpur, Selangor, Putrajaya & Cyberjaya)) who require special arrangement for race pack collection, please drop us an email at customerservice@msports.com.my latest by Saturday 30th December 2017. Race Pack Delivery to your home/office will be provided at RM 10 per race pack for major town/cities in WEST MALAYSIA only. Please provide an address whereby there will be someone to receive your race pack as the delivery will take place, Mon to Fri from 9.00am to 6.00pm (during working hours). We advise for your good self to state your office address as the preferred delivery address if you will be at work during the delivery duration. E-Certificates will be awarded to all the participants who complete the 10km only. The e-certificate will be made available 7 days after the event day. All 5km runners will receive their finisher certificate at the finish line. The organizers reserve the right to use any photograph (including those of participants), motion pictures, recordings, or any other media records of the event taken before, during and after the event, for any legitimate purpose including commercial advertising and distribution to sponsors.